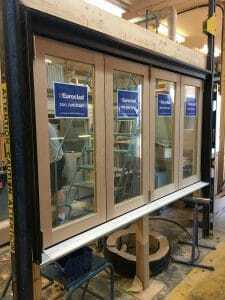 At Euroclad, we’re proud to offer some of the most beautiful custom windows and doors for our residential clients. Our reputation has long been built on providing a quality product that looks great and performs even better. If you’re curious about our work, check out our Facebook page for some of the latest custom products we’ve been putting together. We’re also proud to partner with businesses and commercial operators to offer the same top quality products in industrial strength for their needs. After all, business need windows and doors too. We’ve launched a few new products for both commercial and residential that we’re particularly proud of, and if you run a business or commercial venture, these products may be of interest to you. Of course we’re a custom manufacturer, so if you’re interested in any commercial products, get in touch with us to find out how we can help your business. 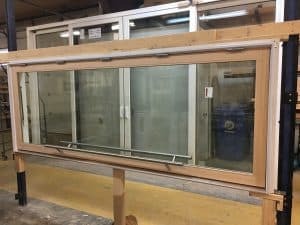 From restaurants and craft beer shops, to home patios and wet bars, a hydraulic server window can really add a wow factor to your outdoor area This window is an easy to open solution for servers of all types. Much like our glass wall systems, the hydraulic server window is designed to really open up a wall in an easy and good looking fashion. 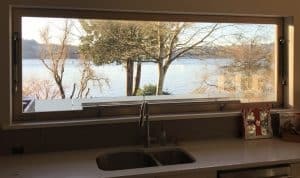 Mostly designed at counter height, these windows allow you to have a fully closed wall that will open up completely when the weather is right. Our hydraulic server window is the perfect blend of a quality performing product that will look outstanding in your public serving area. A large swing door can be used for many commercial and industrial operations where you need more door space, or a different look, than a standard industrial garage door can provide. Residential customers love them for hobby farming, garages, and unique home features, but businesses love them for their flexibility. Oversize swing doors can allow you to reach new heights, while providing an easy-to-open door that doesn’t require any special overhead rails like a garage door would. You’ll find these doors most often used in industrial applications and parking garages. These doors are built tough, as they’re meant for tough environments. Of course we can paint them to any colour of your choosing, but these doors have a distinct industrial look. The important feature in these doors is that they’re fire rated. If you need to protect areas of your building, shop, garage or factory from fire, this door will get the job done. At Euroclad, we don’t just make great looking quality products for your home, we do it for your business as well. It’s just as important that commercial products feature the same quality and attention to detail that you’ll find in our residential products. If you have any questions about any of the products here, or you have some questions about a custom product you need for your business, give us a call or drop by our showroom and we’ll do our best to help you out.